Do you need a creative yet simple project to do with the family? Try growing sugar crystals. It’s a lot of fun. Growing sugar crystal is a very simple, fun project that can be used for science fairs and show and tell. It is very close to the way you grown salt crystals. 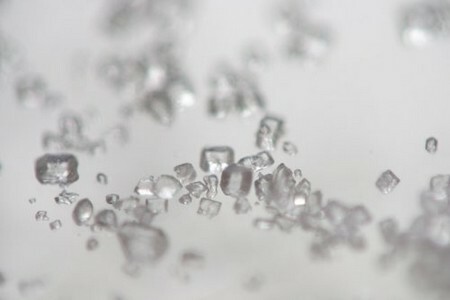 However, sugar crystals are slightly more exciting because they can be eaten and they taste create. They are a creative treat that is easy to make. Here is how you can grow sugar crystals. Follow the recipe below. Continue to read for more information. Bring a cup of water to a hard boil in a pot of saucepan. Carefully pour the boiling water into the glass jar. Use oven mitts to handle the hot pot. Be careful of the steam as it rises from the water. You could easily get burned. You will add the sugar to the hot water in the jars one teaspoon full at a time. Continue until you have added the entire 3 cups. Take this step slowly. Dissolve every spoon ful before moving on to the next one. Steadily add the sugar until the water will don’t dissolve it anymore. The sugar will begin to settle at the bottle of the glass jar. Decide which color you want your sugar crystals to be. Add the food coloring to the solution. Tie the cotton string to a pencil. Then, secure a paper clip at the other end. Put the pencil on top of the jar and allow the string to hang into the solution. The paper clip will almost touch the bottom of the glass jar. Look at your sugar crystals a day later. You will see the beautiful color sugar crystals adhering to the string and paperclip. Put a paper towel on the very top of the glass jar to stop any dust particles form settling into the solution. You are free to use other objects instead of the paper clip. This weight is up to you. If the cotton string is too long, cut the string, or roll the extra cotton string around the pencil to take up the slack. Make sure the jar you are using can take the heat of the boiling water. Use extreme caution around boiling water. Use mitts to handle hot things.